Produced by Storyhouse, the 2016 season will see productions of Shakespeare’s As You Like It and The Two Gentlemen of Verona and a new adaptation of the children’s classic Stig of the Dump staged at Grosvenor Park Open Air Theatre this summer. Opening on Friday 1st July and running until Sunday 21st August the 2016 season is the biggest to date, with 59 performances in the season’s schedule. Alex Clifton, Artistic Director, Storyhouse, who is producing the season said: “We are thrilled to be announcing our 7th season of Grosvenor Park Open Air Theatre, at the heart of a monumental year for Chester’s cultural scene. Our 2016 season presents two very different Shakespeare comedies – an anarchic farce and a magical romance – which we can’t wait to share with our summer audiences. One of the century’s best-selling and enduring children’s classics, Stig of the Dump by Clive King, will be brought to the open air theatre by the same team as sell out hits Wind in the Willows and The Secret Garden. The Bard’s incredibly popular pastoral comedy ‘As You Like It’ is the season’s headline Shakespeare, performed in rep with the ‘ridiculous’ ‘The Two Gentleman of Verona’. 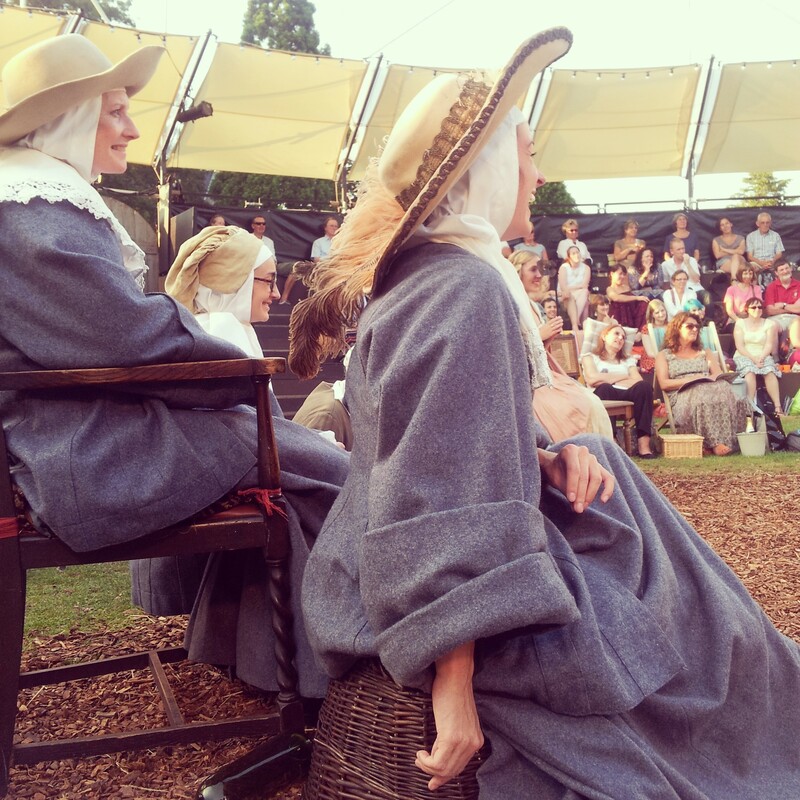 In 2015 the award winning season of open air theatre welcomed over 25,000 theatregoers to its nine week season and it won Event of the Year in the region’s tourism awards, beating off competition from Chester Zoo and Just So Festival. Storyhouse are expecting this year’s season to be more popular than ever. Tickets are on sale now. 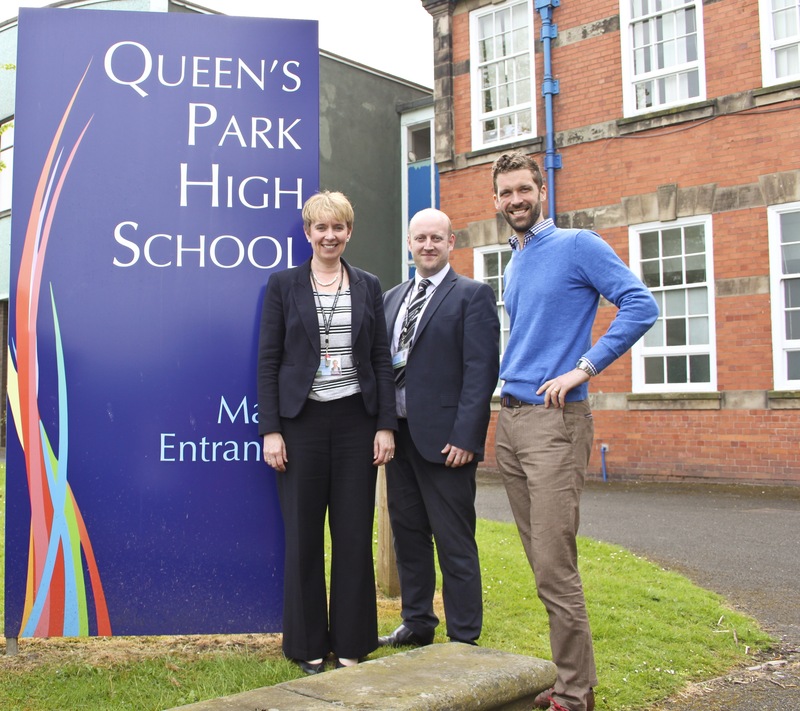 Images of the cast of As You Like It, The Two Gentlemen of Verona and Stig of the Dump – this year’s productions for Grosvenor Park Open Air Theatre, rehearsing ahead of the show’s opening next month have been released. The pictures feature the entire cast rehearsing scenes from Alex Clifton’s production of Shakespeare’s comedy The Two Gentlemen of Verona. The award winning Grosvenor Park Open Air Theatre opens Friday 1st July and will run until Sunday 21st August, it is expected over 26,000 people will experience the unique in the round, open air theatre. Storyhouse has announced full cast for this summer’s Grosvenor Park Open Air Theatre taking place 1st July – 21st August 2016.Featuring a company made up of equal numbers of men and women, the season will stage productions of The Two Gentlemen of Verona, Stig of the Dump and As You Like It. The ensemble cast will perform across all 3 productions: As You Like It – directed by Philip Wilson, Stig of the Dump – directed by Derek Bond and The Two Gentlemen of Verona directed by Alex Clifton. Playing Stig in the brand new adaptation by Olivier winner, Jessica Swale is John Seaward, he will also play Jacques in As You Like It. Previous roles include Big John in cult comedy The Inbetweeners and Luke in the BBC’s Survivors. For theatre he played the BFG for the Bolton Octogan. Stig of the Dump’s Barney will be played by LAMDA graduate Anton Cross, he will also play Le Beau in As You Like It. Barney’s sister Lou will be played by Charlotte Miranda-Smith, previous theatre work includes Susan in The Lion, The Witch and The Wardrobe (Royal Lyceum Edinburgh) and Maria in West Side Story (Royal Conservatoire Scotland). She was a finalist for The Stephen Sondheim Student Performer of the Year and will play Celia in As You Like It. From Grosvenor Park Open Air Theatre’s 2013’s productions of Othello, A Midsummer Night’s Dream and Cyrano de Bergerac is Katherine Toy, who will play Grandma in Stig of the Dump; other recent theatre works include Merlin at Theatre Royal Northampton and The Prince and the Pauper for Unicorn Theatre. Rosalind will be played by Rose O’Loughlin. Recent theatre works include The Lieutenant of Inishmore at The Royal Lyceum, Sam Shepard’s Curse of the Starving Class at The Abbey, Dublin. Orlando will be played by Fred Lancaster previously seen in This House (National Theatre), Henry V (Michael Grandage Company/West End), The Silver Tassie (National Theatre). Touchstone will be played by Ben Tolley, theatre includes The Wind in the Willows (Lord Chamberlain’s Men) and The Snow Queen for Chester based Theatre in the Quarter . Fresh from last year’s season playing Nurse in the acclaimed Romeo & Juliet is Danielle Henry, she will play As You Like It’s Phoebe. Ian Harris who will portray Duke Frederick in As You Like It and Grandad in Stig of the Dump has appeared in theatres throughout the UK and beyond. Favourite roles include Teddy in The Homecoming and Fabian in Twelfth Night at York Theatre Royal. Graduate of the Royal Academy of Music, Kate Marlais will play Amiens in As You Like It. Jacques Lecoq graduate. Robert Willoughby will star as Valentine in The Two Gentlemen of Verona and Oliver in As You Like It. His recent theatre work includes The Adventure at the Lyric Hammersmith and Grimm Tales for Young and Old at the Bargehouse. Harry Livingstone will play Charles in As You Like It and Proteus in The Two Gentlemen of Verona. Old Vic graduate, Pippa Moss will play Hisperia in As You Like It, the teacher in Stig of the Dump and Julia in The Two Gentlemen of Verona. Recent theatre work includes Macbeth for the Guildford Shakespeare Company. LAMDA graduate, Hatty Preston, who originated the role of Minty in Jennifer Saunders’ Viva Forever (Piccadilly Theatre) will play Audrey in As You Like It, Lil in Stig of the Dump and Silvia in The Two Gentlemen of Verona. Johnson Willis will play Launce in The Two Gentlemen of Verona. Johnson is no stranger to Chester having worked extensively at Theatr Clywd where he has appeared in Silas Marner, Twelve Night, King Lear, Troilus and Cressida, The Cherry Orchard, Happy End and Animal Farm. Tickets for Grosvenor Park Open Air Theatre are on sale now. Grosvenor Park Open Air Theatre is looking for the perfect pooch to play the role of Crab in its upcoming production of The Two Gentlemen of Verona. Opening July 1st and running until August 21st The Two Gentlemen of Verona will be performed in rep with a brand new adaptation of Stig of the Dump and Shakespearean comedy As You Like It. Auditions will be taking place on Monday 23rd May from 6pm at Queens Park High School, Handbridge . The dog must be calm, friendly and comfortable in front of large crowds (many of whom will be picnicking), any breed of medium/large dog is acceptable. No acting experience is required, the dog will remain on a leash when on stage and will only appear for a short time in 2 separate scenes. The most important factor is that there is total commitment from the owner for the entire run of the show. Applicants must be prepared to commit to every performance during the run of the show, including all matinee and evening performances (there are 17 separate performances between Friday 22nd July to Saturday 20th August 2016). All expenses will be paid to the successful applicant. Interested dog owners should email helen@storyhouse.com for an application form. Application deadline: Thursday 19th May 2016. The Handbridge School is hosting the cast and creative crew for their rehearsals of Stig of the Dump, As You Like It and The Two Gentlemen of Verona which will be performed in rep between July 1st and August 21st this summer. The cast of 16, made up of equal numbers of men and women, will be based at the school for 10 weeks. There is nothing in the night outside the theatre that speaks of the dark. Our early August evening is bright and full of good looking people. We’ve become accustomed to this magic in Chester, this lovely theatre in Grosvenor Park that grows like the summer itself. The building of the wooden terraces and temporary theatre in the round evokes picnics and festivals, fair weather and holidays. Macbeth is tragedy, full of darkness, and tells how the Scottish general, Macbeth receives a prophecy from a trio of witches that one day he will become King of Scotland. Consumed by ambition he acts to make this true, murdering the king, taking the throne for himself. He is then forced to commit more and more murders, falling into arrogance, madness and death. The opening genius of this production is the setting. Chester Performs excels at this, the physical theatre, the costuming; all the tactile component parts of the staging. The darkness of Macbeth’s night begins in battle. And what careful camouflage they wear; these soldiers are costumed and caught between the aeons. Green fatigues that might be inter-war, influenced by other times too. Already we’re beginning to see that this time is all times. So much of Shakespeare is familiar, even if you last read or watched at school and maybe then it was reluctantly. A quick roll call of quotes, that have inspired other things, crept into our general turn of english phrase? Tomorrow and tomorrow and tomorrow; full of sound and fury; something wicked this way comes, Double, double, toil and trouble; Fire burn, and cauldron bubble; what’s done, is done; Blood will have blood. It is very much part of our foundations. The performance has so much cold and tragic ambition in Lady Macbeth, the status quo in a fondly played King and a strongly performed Macbeth falling to his inevitable end. There are so many stories within this whole, each brought to life once more. But who owns a story? By the time of the first recorded performance of Macbeth Shakespeare was 42 and halfway through his playwriting career. My point is this: he knew he was successful. He’d also be aware that audiences and critics will all take something different from a show. In his imagination could he have seen you, reading this electronic review of mine, more than 400 years later? Still discussing how he shapes language? How his ideas are still relevant to this world, now? With a capacity in the Open Air Theatre of 300 or so, you can guarantee that there were 300 or so different stories seen that night? Each person there mixed this story with their own, took something new from it. That’s the true enchantment of theatre, isn’t it? There’s lots to recommend this particular production but a couple of images will stay with me for a long time. The first is pure drama. As Macbeth attempts to regale his court with a banquet; to celebrate his success; he is haunted by the friend he murdered; Banquo. The ghost of Banquo occupies the empty seat at the table; a bloody and disturbing spectacle in itself. Macbeth begins to lose control, to rave at the presence of the spectre. From her cold heart Lady Macbeth regains mastery of the situation but only for a little time. From there Banquo advances, physically disjointed by death from reality, appalling and slack limbed, he crawls down the banqueting table. The dinner things are scattered and the remains of Macbeth’s composure is ripped away by the ghostly Banquo. It is a moment of perfect theatre. The second image is an idea that finds it’s fulfilment and unfolding in the hands of Thomas Richardson as Macduff. Macduff is Macbeth’s ending; he is the man ‘not of woman born’; the only man in front of whom Macbeth will be vulnerable. The potential insolence of Macduff’s nobility of heart is swept away Thomas’ pure conviction in the role; utter believability. For me this Macbeth was very much about entitlement; about the horror that is wrought when we act in unthinking expectation of something that is promised to us. Macbeth takes what he is promised by the witches and there is a bloody path to his crown. Macduff delivers the final blow, the last cost of the journey to the crown. And he does it very well. There’s a welter of positive acclaim for Chester Performs and the Open Air Theatre and for good reason. There’s still limited availability for the performances of Macbeth and the other current productions of The Comedy of Error and The Secret Garden. Don’t do the last minute booking thing and let the experience slip pas you; swamp Chester Performs with a clamour for those last tickets. I had the pleasure of reviewing Othello and Cyrano De Bergerac earlier this year, so I was pleased to see director Glyn Maxwell and playwright Alex Clifton added to the Essar Chester Literature Festival roster. As an outdoor theatre newbie and a late adopter of classical theatre, I wanted to hear more about the mechanics behind these plays. Messrs Maxwell and Clifton did not disappoint. The evening resembled a cosy fireside chat. Alex, our host, gently coaxed Glyn to talk about his work and to discuss this season’s open-air theatre in general. They were comfortable in each other’s company. The mutual respect and warmth suggested friendship. We’re in pipe and slippers territory here, which was just fine with me. The evening started with a reading of “Byelaw” from Pluto, Glyn Maxwell’s new poetry collection. I liked the poem as I could relate to the theme. Glyn seemed to enjoy bringing his work to life and it was a privilege to hear the poem read in its original voice. An anecdote about how actor Martin Jarvis (insert link) fluffed up a reading of the poem confirms this. Let poets read their work, exclaimed Glyn. The poem sparked a discussion about the mechanics of poetry and plays. What governs Glyn’s work? It’s God for Shakespeare, time for Glyn. It’s wonderful to hear a writer talk about their drives – the passing of time, the uncertainty of truth. Glyn discusses his admiration for Auden and his rare ability to communicate an idea through poetry, which hints at insecurity. It’s deeply personal and for me this was worth the admission fee alone. Prose or verse, that is the question – or topic for discussion, as it were. Directors work against a culture of prose, suggests Alex, with its pauses and its places to hide. The verse is ongoing and ever flowing, with the need to speak, the thought on the line. Both men prefer to dwell in the verse. I swing both ways, but I did enjoy Glyn’s description of a sonnet as “having fourteen lines to do something with before you really should be doing something else with your lover”. Remember that next time you make your play. 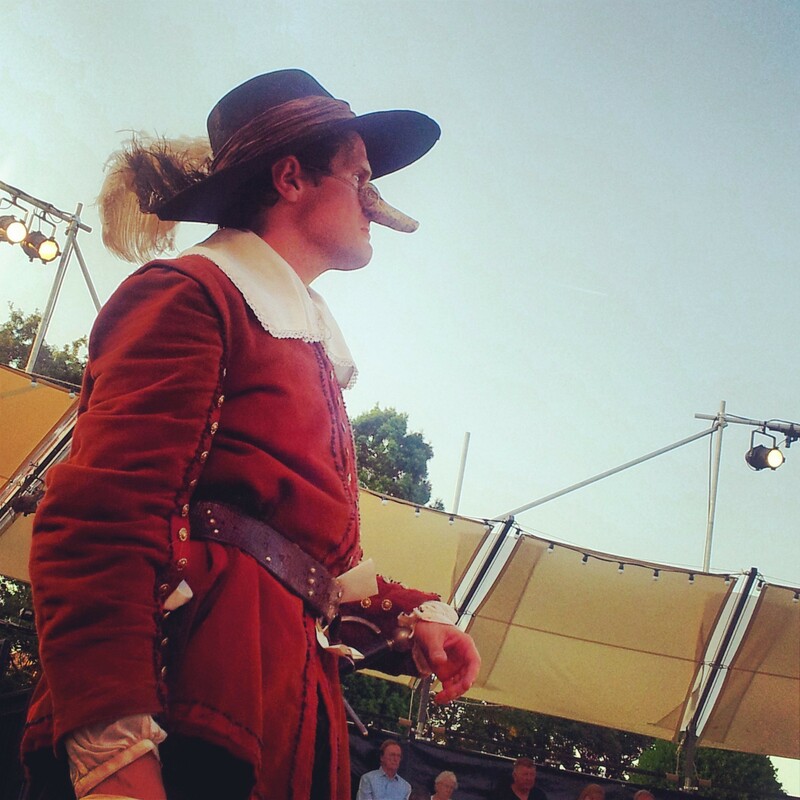 We finish with the pain and pleasure of adaptation – in this case Glyn and his Cyrano. Producing something different from what has gone before. Concentrating on those scenes that did not feature the three principal characters. The decision to remove much of the war, redressing the severe gender imbalance and adding a few songs. Retaining the ‘brave’ fifteen-year leap, that finds the characters in their dotage. Relishing the “love of the other and the love for another” dynamic that brings alive the Cyrano and Roxanne scenes. He makes it all seem rather easy. As we gently strolled toward the Q & A, our hosts agreed that the joy of what they do is that if they have a bad day no one gets hurt. We, the punter, may not like the work and may feel we’ve wasted our money, but no one has died. And, we learn that Glyn owes his life to drama, of the amateur kind, as it brought his parents together. 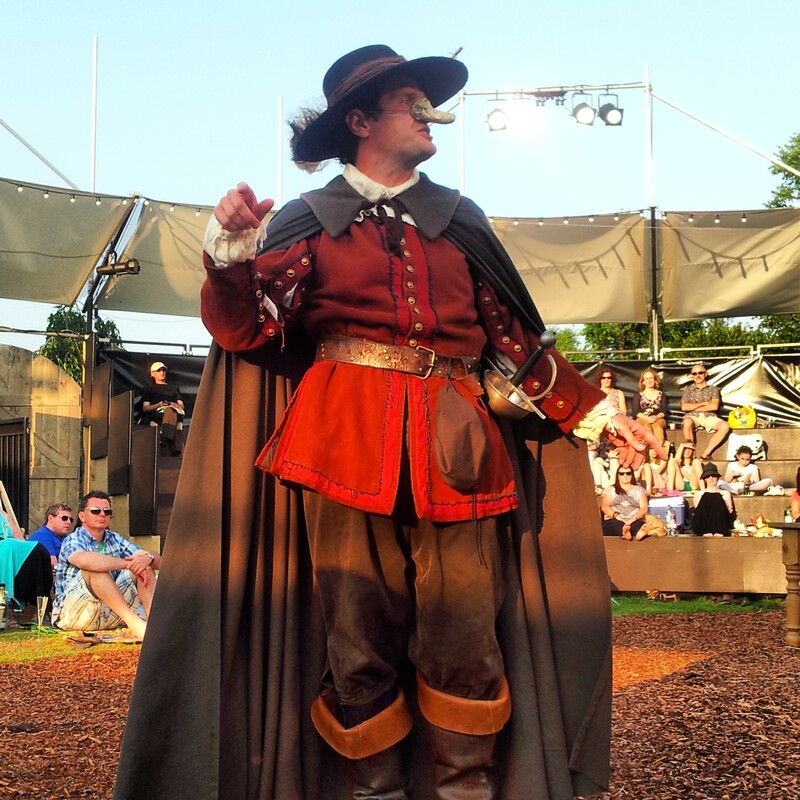 The Grosvenor Park Open Air Theatre has been delighting its audiences since its launch back in 2010 by champions of Cestrian culture Chester Performs. With nine critically acclaimed productions under its belt, the open air group goes to show it only improves with age as it wows us with this year’s outstanding productions of Othello, A Midsummer Night’s Dream and Cyrano de Bergerac. Having previously written for the Grosvenor Park theatre, Glyn Maxwell makes a triumphant return with this striking, new adaption directed by Lucy Pitman-Wallace; no mean feat, with the writer having to tackle the original work’s forty three named parts – as well as a host of soldiers, courtiers, poets and more – all inhabiting five utterly different sets, from a baker’s shop to a war-zone, and somehow transform it all into twelve actors performing in one single outdoor space. Shuffling the play’s chronology, the nun’s from Act V are ingeniously brought forward to the opening (thus seamlessly framing the plot) as they begin to recount the tale of the soldier-bard from some fifteen years before. Before long, we see the nun’s take on the roles of many of those in the story, suddenly arming themselves and donning plumed hats as they riotously merge with other figures that enter now from all directions in sumptuous period costume, along with the titular protagonist himself played by Edward Harrison. The actor’s portrayal of de Bergerac and his legendary panache is superb: sporting a stylised nose cleverly crafted from parchment covered in poetry, Harrison is charismatic, witty and collected with the most perfect theatrical timing. Indeed, the whole cast ought to be praised for their stellar performances, not least the nuns with their ever-changing roles; perhaps most notable amongst them being the talented twins Danielle and Nichole Bird. Many of the cast also had a chance to showcase their musical accomplishments: during a rousing and rustic Gascon anthem played to lighten all hearts before battle; Katherine Toy’s pleasing accordion interludes between and even during scenes; the emotive and truly haunting a capella chanting of what seemed to be a Latin mass during the dual between Cyrano and one hundred men, skilfully choreographed in slow motion by Sue Nash. 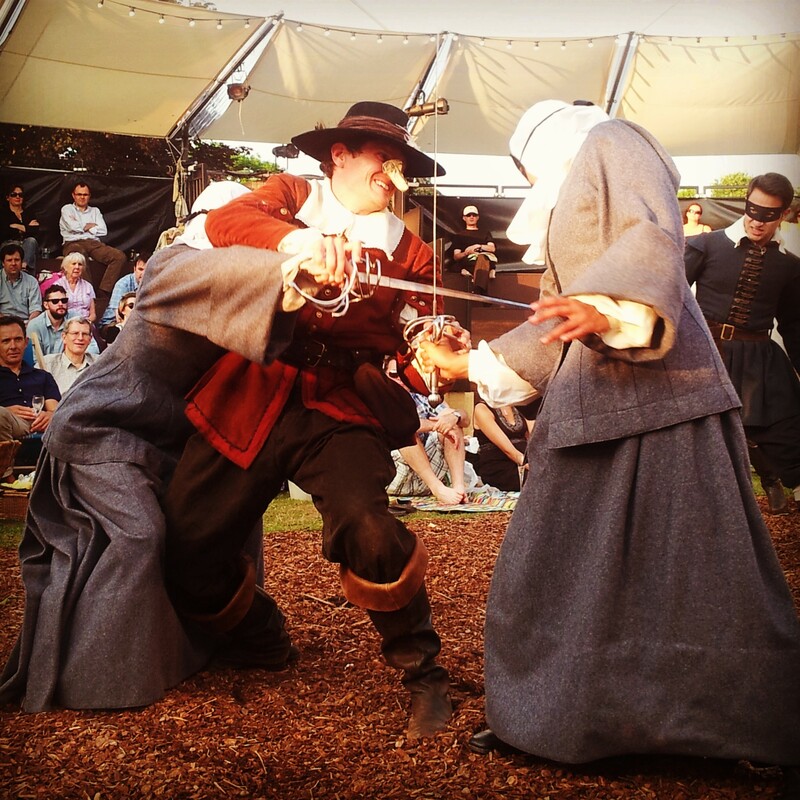 With actors scaling the seating and livelily interacting with audience members happily picnicking mere feet away, Cyrano de Bergerac is an outstanding performance – at times brimming with humour at others poignant and heart-rending – that is sure to thrill this summer’s theatre goers.